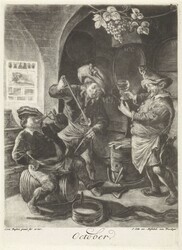 Henriette Rahusen, Dutch Burghers and Their Wine: Nary a Sour Grape , National Gallery of Art, https://purl.org/nga/documents/literature/essays/dutch-burghers-and-their-wine-nary-a-sour-grape (accessed Apr 19, 2019). J. H. W. Unger and W. Bezemer, eds. De oudste stadsrekeningen van Rotterdam (Rotterdam, 1899). Except where noted, the following information is derived from my book: Henriette de Bruyn Kops, A Spirited Exchange: The Wine and Brandy Trade between France and the Dutch Republic in Its Atlantic Framework, 1600–1650, The Northern World 32 (Leiden, 2007). People tended to drink “new” wine, as wines did not keep well and even higher-quality ones turned bad after about a year. Stronger and longer-lasting wines would have been reserved for truly special celebrations. The case of a June bride hints at the occasions when Dutch burghers splurged. Afraid to serve her wedding guests inferior wine (often referred to as slootwater, or “ditchwater”), a bride-to-be and her brother visited the cellars of a wine buyer to taste the contents of a barrel of upscale French wine. Their subsequent order for one oxhead of the wine reveals that it must have been a grand party to warrant the purchase of 228 liters (60 gallons) of wine [fig. 3] [fig. 3] Jacob Duck, The Wine Connoisseurs, c. 1640–1642, oil on panel, Rijksmuseum, Amsterdam, Purchased with the support of the Vereniging Rembrandt, SK-A-1940. 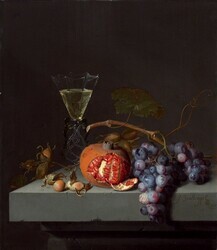 Wine’s status as a luxury product does explain its presence in many of the still-life and genre paintings of the Dutch Golden Age, but artists undoubtedly also included the translucent liquid in elegant glasses to show off their virtuoso handling of pigments and brushes [fig. 4] [fig. 4] Jacob van Walscapelle, Still Life with Fruit, 1675, oil on panel, National Gallery of Art, Washington, Juliet and Lee Folger/The Folger Fund, 2001.71.1. A. Schierbeek, “Landmeten en wijnroeien in Leeuwenhoek’s tijd,” De Natuur 60, no. 7 (1940): 117–119, 145–148, 178–180. The various taxes placed on alcohol made smuggling an attractive option. Tax evasion, however, also created unfair competition by allowing a tavern keeper or wine merchant to sell his stock at below-market prices. One account mentions two wine buyers going undercover to assess the black market. In an unlicensed house “filled with so many people that it was difficult to find a place to sit,” they drank new wine at the bargain price of 25 cents per pitcher. In another tavern, the publican admitted that he “sold much more smuggled wines than before,” but that he was loath to have too many people flock to his establishment because it might draw the attention of the law. Only failed attempts to avoid the hated excise tax on alcohol turn up in public records. For example, in 1628 municipal impost officials arrested a woman leaving a wine buyer’s house with a pitcher of wine for which she had not paid tax, despite a boisterous crowd coming to her aid. In a second case, a revenuer stopped a woman carrying a bottle of wine that did not have its impost voucher [fig. 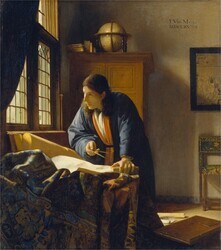 6] [fig. 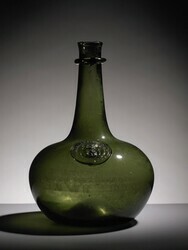 6] Bottle with Glass Seal, c. 1660–1670, clear, dark green glass, Rijksmuseum, Amsterdam, On loan from the Koninklijk Oudheidkundig Genootschap. The story, dating from 1627, is remarkable because the use of bottles remained a rarity for much of the first five decades of the century, as almost all wines were kept in barrels until bought by the consumer. Another report describes men drinking wine straight “from the big barrel.” After getting a hold of “an eighth” (of a bushel?) of oysters, a wine buyer and three friends decided to wash the shellfish down with “house” wine. They were sitting on small barrels around the large barrel in the wine buyer’s warehouse when impost officials caught them red handed [fig. 7] [fig. 7] Cornelis Dusart, October, 1679–1704, engraved print, Rijksmuseum, Amsterdam. A moralistic publication of 1641 warns Dutch youths against debauchery in taverns. Upper-class students, enrolled in Rotterdam’s Latin school, spent much of their time drinking and playing cards in taverns. A group of four revelers ran up a huge tab of 24 guilders in the tavern The Prince’s Ship, and after gambling away all their money, they first pawned their clothes but later resorted to theft to pay for their wild ways. They were expelled from school. Sir William Temple, Observations upon the United Provinces of The Netherlands (1672; repr. Oxford, 1972), 120. Voluntary poverty notwithstanding, the port records for Amsterdam seem to suggest that in fiscal year 1667–1668 the good people of Amsterdam consumed 20,622.5 tons of imported French wines. Applying the population estimate of 220,000 residents in the 1680s, per capita consumption of French wines alone would have been 85.6 liters (22.6 gallons) per year, or almost 0.25 liter (one cup) per day, for every man, woman, and child. But these numbers do not include smuggled quantities or wines from any other supply zones, nor could all families afford to drink wine. Those who did spend money on wine clearly drank far more than the above-mentioned average. A poem of 1623 emphasized that “wine chases away sadness,” but this mood enhancer only applied to the happy few who drank wine on a regular basis. And it was this happy echelon of Dutch society, with a glass of wine at hand, that the masters of genre painting depicted so expressively [fig. 8] [fig. 8] Esaias van de Velde I, An Elegant Company in a Garden, 1614, oil on canvas, Rose-Marie and Eijk van Otterloo Collection. Richard W. Unger, A History of Brewing in Holland 900–1900: Economy, Technology and the State (Leiden, 2001), 91–98. Except where noted, the following information is derived from my book: Henriette de Bruyn Kops, A Spirited Exchange: The Wine and Brandy Trade between France and the Dutch Republic in Its Atlantic Framework, 1600–1650, The Northern World 32 (Leiden, 2007). Sir William Temple, Observations upon the United Provinces of The Netherlands (1672; repr. Oxford, 1972), 120.